Joseph Farquharson (1846-1935), The Road to Loch Maree (date not known), oil on canvas, 61 x 91.5 cm, location not known. Wikimedia Commons. The Highlands and Islands of Scotland offer some of the most wonderful scenery in the world, from deep, wooded glens between rugged peaks, to islands dissected by lochs, and deserted sandy beaches. In this article and the next, I show a selection of landscape paintings of those areas, which not only reflect the natural beauty, but illustrate the changing styles of those artists who painted there. This first article includes work by Scottish painters, and the next by artists who were just visiting Scotland. Alexander Nasmyth (1758–1840), Loch Awe, Argyllshire (c 1785), oil on canvas, 50.8 x 61 cm, Yale Center for British Art, New Haven, CT. Wikimedia Commons. Alexander Nasmyth was one of the early Scottish landscape painters, although he started his career in portraiture. His figurative painting steadily moved outdoors, and in 1792 he devoted himself exclusively to landscapes. 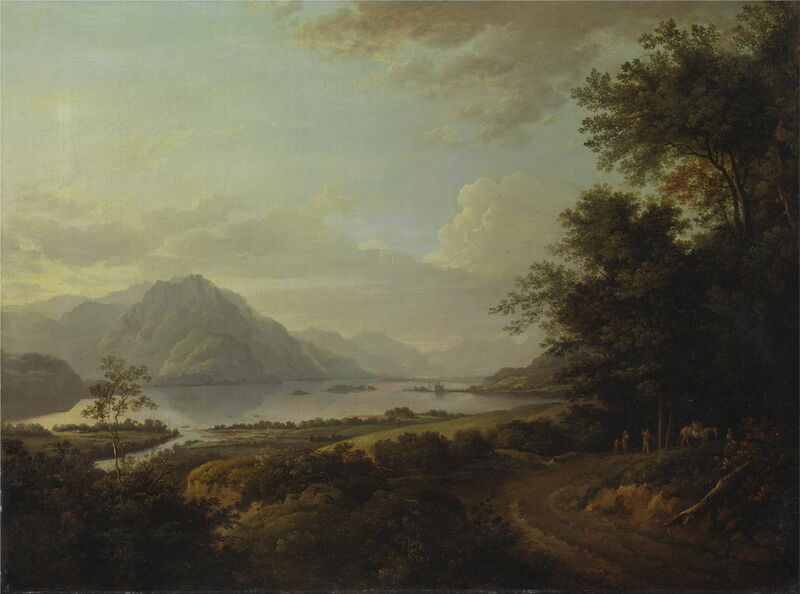 This painting of Loch Awe, Argyllshire (c 1785) shows the freshwater lake just over forty kilometers (25 miles) long, making it the longest in Scotland. Situated on the west coast, it offers excellent trout and salmon fishing. Alexander Nasmyth (1758–1840), View of Tantallon Castle and the Bass Rock (date not known), oil, dimensions and location not known. Image by Stephencdickson, via Wikimedia Commons. Nasmyth had leanings towards engineering, including the construction of lighthouses. 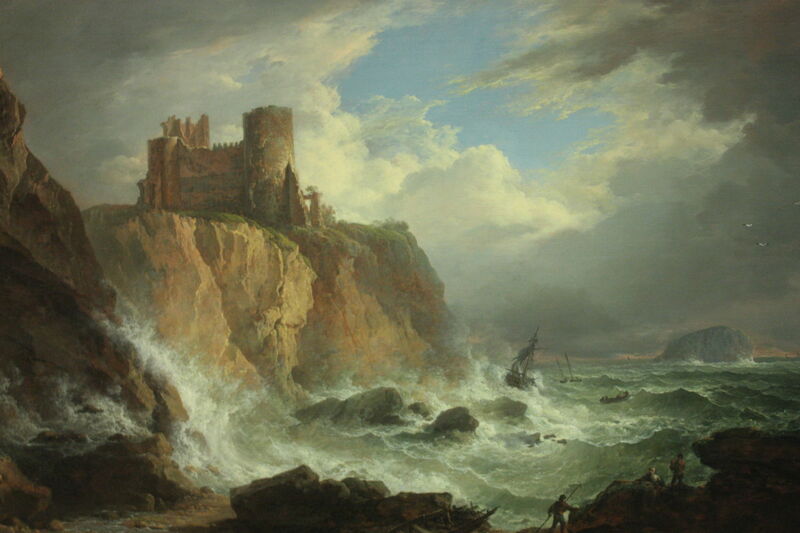 His undated View of Tantallon Castle and the Bass Rock shows this semi-ruined castle on the top of cliffs looking out into the Firth of Forth, to the tiny island of Bass Rock, which was used by King James I for some of his political opponents. It now has a lighthouse, which was not built until 1902. Nasmyth was an excellent and popular teacher too: among his pupils were Clarkson Stanfield and the father of John Ruskin. All six of his daughters also became accomplished artists. Hugh William Williams (1773–1829), Glencoe (c 1812), oil on canvas, 61 × 91.5 cm, location not known. Wikimedia Commons. Hugh William Williams was another early Scottish landscape specialist, who painted many popular topographic views of Scotland, and of his tour of Italy and Greece. 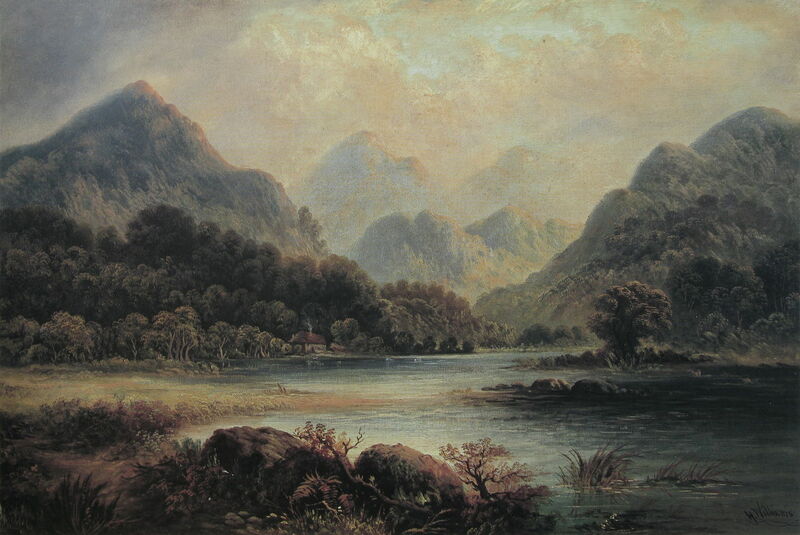 He made this view of Glencoe (c 1812) before going to Europe. He captures the wildness of this glacial valley which is lined by some of the finest walking and climbing in Europe, including the peaks of Ben Nevis, the Three Sisters of Bidean nam Bian, and the Aonach Eagach ridge. Horatio McCulloch (1805-1867), Loch Fad, Isle of Bute (1844), oil on canvas, 53.5 x 75 cm, location not known. Wikimedia Commons. Horatio McCulloch started painting landscapes seriously in about 1825, at first continuing the tradition and style of Alexander Nasmyth. As he developed his own style, he became established as the leading landscape painter in the country. Loch Fad, Isle of Bute (1844) shows this long freshwater lake on the island of Bute, on the south-western coast of Scotland, to the north of the Isle of Arran, and west of Glasgow. 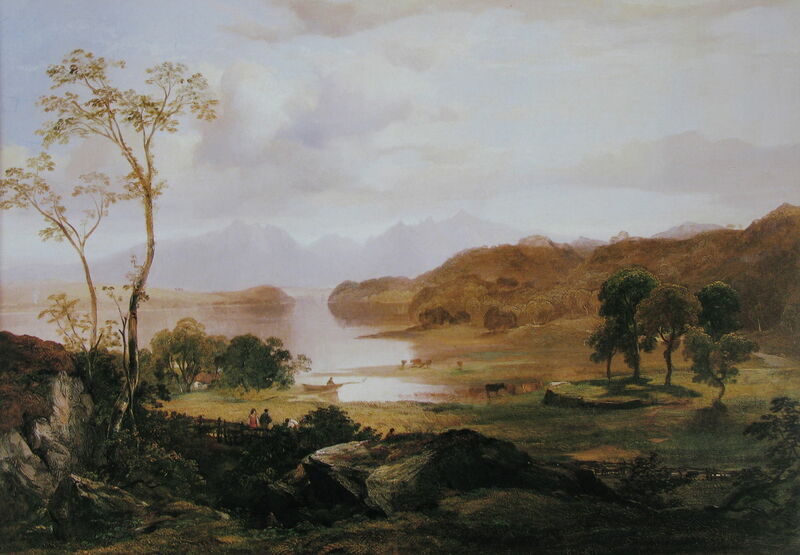 Horatio McCulloch (1805-1867), A View of Loch Lomond (date not known), oil on canvas, 76 x 127 cm, location not known. Wikimedia Commons. 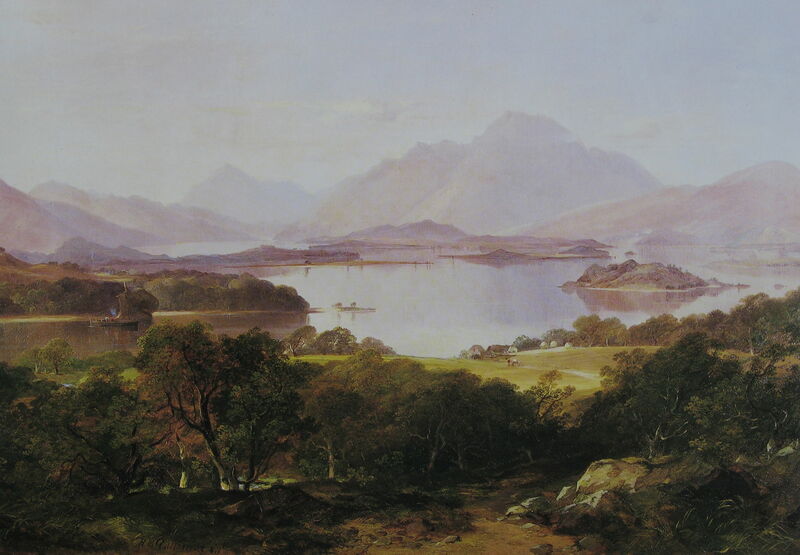 McCulloch’s undated View of Loch Lomond shows this famous lake in the Trossachs to the north of Glasgow; Loch Lomond is the largest inland body of water in Great Britain, excluding Northern Ireland. Straddling the border between Central Scotland and the Highlands, it is very accessible from the cities of Glasgow and Edinburgh, and popular with Scots and tourists from outside Scotland. 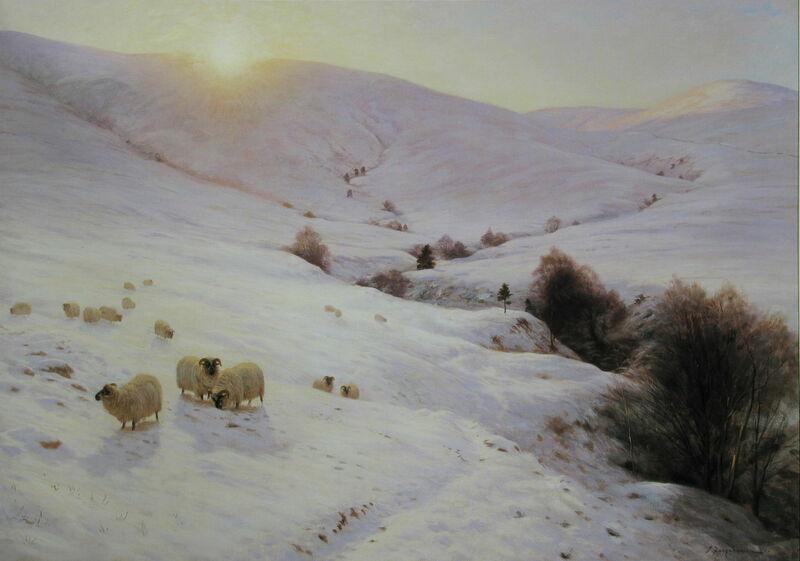 Joseph Farquharson was another landscape specialist, who trained both in Edinburgh and in Paris under Carolus-Duran. He became most famous for his winter views, usually richly encrusted with snow. Although most were painted in the studio, he had a wheeled shed built which allowed him to paint in front of the motif, if not quite en plein air, through the harsh winters. 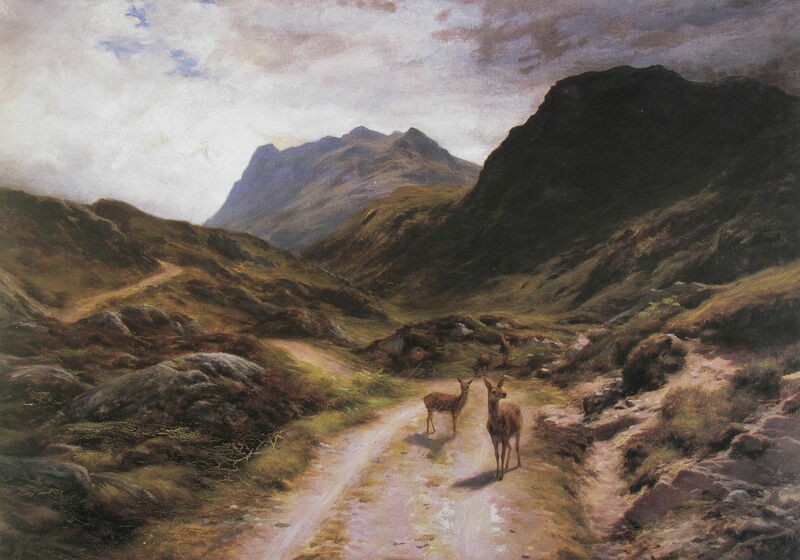 Farquharson’s The Road to Loch Maree shows one of the most remote locations among this selection of works, as it is in Wester Ross, in the Northwest Highlands. The loch, the fourth largest freshwater lake in Scotland, is dotted with islands, some of which are wooded. Joseph Farquharson (1846-1935), The Sun Peeped o’er yon Southland Hills (date not known), oil on canvas, 42 x 60 cm, location not known. Wikimedia Commons. Farquharson’s The Sun Peeped o’er yon Southland Hills is more typical of his snowy scenes, with sheep and trees breaking the blanket of white. The location suggested by its title could refer to the Sutherland area of the far north-western tip of the Scottish mainland, near Loch Maree. Some of the most radically innovative landscape painters of the early twentieth century were the group of Post-Impressionists now known as the Scottish Colourists, including Samuel Peploe and his close friend Francis Cadell. Samuel Peploe trained in his native Edinburgh and in the Académies Julian and Colarossi in Paris. He first visited Barra in 1894, and later was joined on painting expeditions there by another of the Colourists, JD Fergusson. 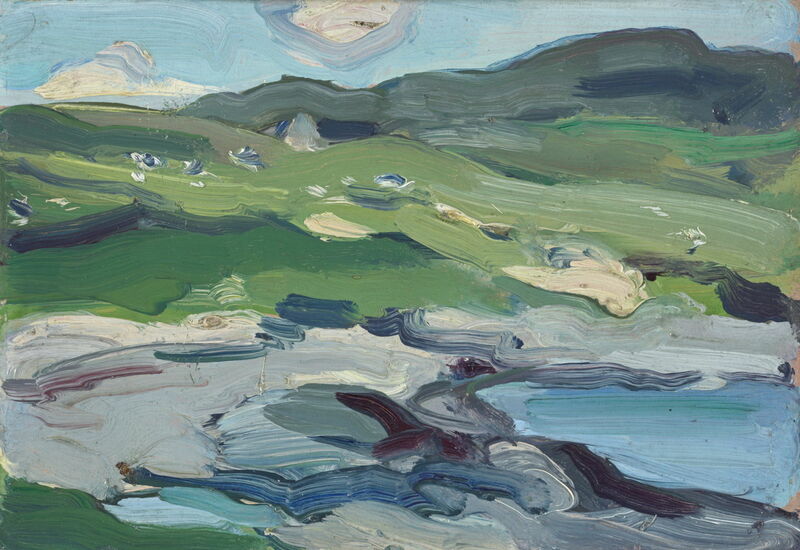 This view of Barra was painted en plein air, and shows the island during his last visit in 1903. Barra is one of the southernmost islands in the chain of the Outer Hebrides, and was the location for filming the original 1949 movie Whisky Galore! Like much of the Outer Hebrides, it is relatively low-lying, and Peploe shows in the distance the ridge of its highest point, Heaval, which rises to just over a thousand feet above sea level. 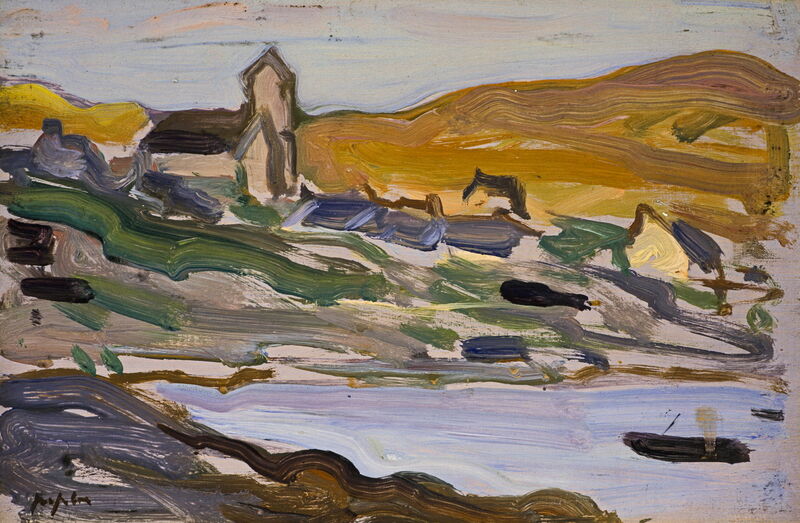 Another of Peploe’s paintings of Barra from 1903 shows the Church of Our Lady, Star of the Sea on the slopes above Castlebay, the main township on the island. This Catholic church was opened in 1888. 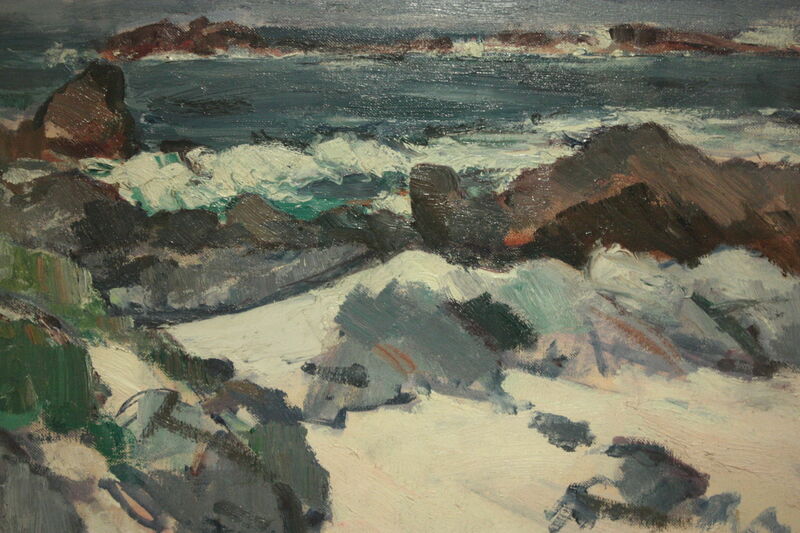 Samuel John Peploe (1871-1935), A Rocky Shore, Iona (date not known), oil, dimensions and location not known. Image by Stephencdickson, via Wikimedia Commons. Peploe first painted on the tiny island of Iona in 1920, during a visit with another of the Colourists, his friend Francis (FCB) Cadell. They returned there in most summers during the 1920s, during which he painted A Rocky Shore, Iona. Peploe became fascinated by the island’s very changeable weather, which swings quickly from brilliant sunshine to gusty downpours. This led him to use cooler colours than in his still life works painted back in his studio. Iona is a tiny island off the south-western tip of the larger island of Mull, in the Inner Hebrides, off the west coast of Scotland. It is most famous for being the site of Iona Abbey, founded by Saint Columba when he brought Christianity to Scotland in 563 CE. 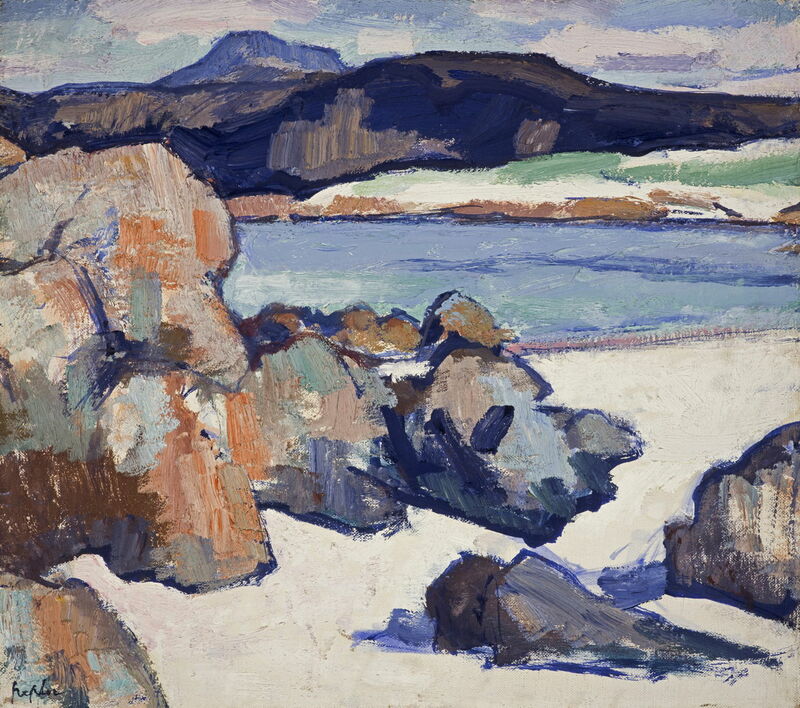 Peploe’s Iona Landscape: Rocks (c 1925-27) shows a glimpse of a sandy beach backed by the distinctive machair, grassland on fertile shell fragments and sand, with the more rugged scenery of Mull in the background. Francis Cadell trained at the Académie Julian in Paris from the age of sixteen. He first visited Iona in 1912, and it remained a prominent influence in his work. 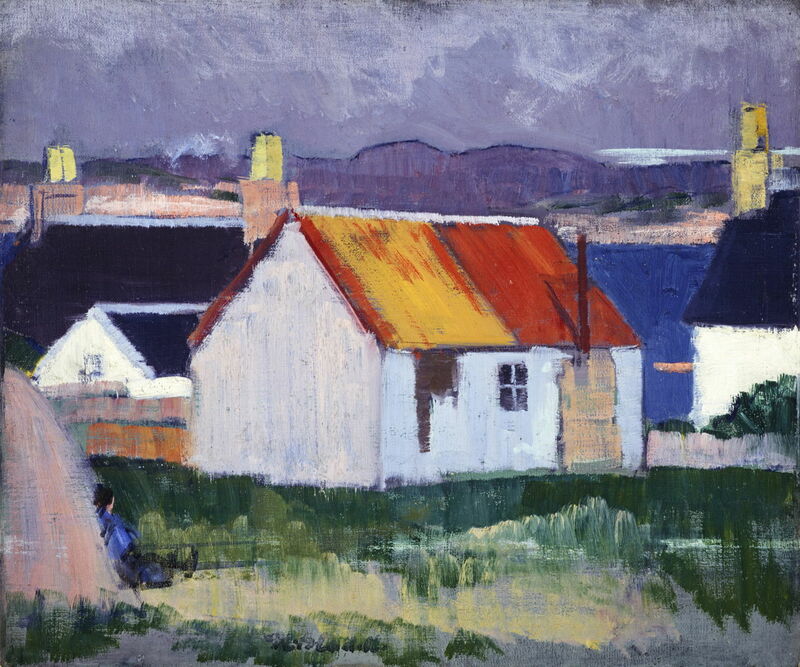 Iona Croft (c 1925) shows subsistence farms on the island in the same brilliant light that Cadell used in his paintings of the Mediterranean coast. The dark hills behind are again those of Mull. Today there are artists’ studios dispersed throughout the Highlands and Islands, and hundreds of resident artists capturing its beauty. If you are one of them, and would like your work shown here, please contact me: I’d love to see it. Posted in General, Life, Painting and tagged Cadell, Farquharson, landscape, McCulloch, Nasmyth, painting, Peploe, Scotland, Scottish Colourists, Williams. Bookmark the permalink.